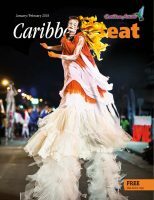 Grotesque masks, jigging Jonkonnu dancers and acrobats, ghost stories, Spanish music and pepperpot these seem far away from carols, mistletoe and chestnuts roasting on an open fire. But they are Christmas traditions in various islands in the Caribbean where the birth of Jesus Christ is celebrated with cultural gifts from many different roots. 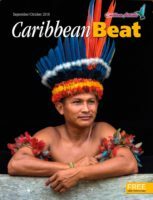 European colonists brought Christianity to the Caribbean, originally to the native Arawak and Carib Indians, though not many of them survived to practise it. Today, European Christmas customs survive everywhere across the region: Christmas morning services in the established churches, feasting on Christmas Day, wassailing or serenading, dances, the giving of gifts and Christmas cards, Santa Claus and Christmas trees. 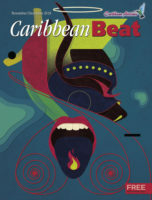 When Africans were brought to the Caribbean as slaves to work on the sugar plantations, they added to Christianity their own customs and, right away, the festival began to evolve and take on a character of its own. In Jamaica, fearsome duppies (ghosts) roamed the countryside at Christmas, the most legendary being Three-Foot Horse, whose terrifying approach was heralded by the sound of irregular hoofbeats, and Rolling Calf, who weakened the hearts of rural folk when he shuffled by, dragging chains along the pathways at night. 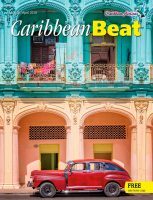 These stories probably date back to the plantations: slaves customarily went up to the great plantation house on Christmas morning to serenade its occupants with songs. Rewarded with a two-or three-day holiday, they made the most of it in their own gardens, reaping provisions both for food and to sell among themselves at the Christmas market. Three hundred years later, the Jonkonnu dancers or “masqueraders” of Jamaica are still a part of Christmas, especially in rural areas. Grotesquely costumed dancers are accompanied by musicians playing flutes, drums and tambourines; they go about soliciting money. With names like Horse Head, Devil, Belly Woman, Pitchy Patchy and Actor-Boy, who would dare refuse them? The origin of the Jonkonnus is unclear, but many believe their roots lie along the Gold Coast of Africa, and have been grafted onto the slaves’ traditional festivities on Christmas evenings long ago. The tradition of Christmas market is still alive, even in Jamaica’s capital city, where children are taken to shop for toys on Christmas morning. At the grand market, the weekend before Christmas, food is sold for Christmas cooking, just as the slaves centuries ago used to sell produce from their gardens on Christmas Day. In Antigua, too, Christmas traditions are primarily of European and African origin, Scottish settlers having brought Christmas to the island. “Old time Christmas” customs in Antigua have been described in detail, including Carol Trees, John Bull (Jam Bull), Highlanders, Long Ghosts and Jumpa-Ben. Carol Trees were made from a stick with several cross-bars, like a telephone pole; with lanterns hung from the branches, they were carried from house to house by carol singers, accompanied by the music of an accordian (concertina). In Antigua, John Bull is a grotesque character based on an African witch doctor. Dressed in dry banana leaves and old clothes, he was probably created by African slaves to satirise their British masters: the costume closely resembles that of the Sensay dancers from Guinea who performed at the end of the first stage of work initiation. The Highlanders are part of Antigua’s Scottish heritage, and still perform at Christmas. They dance the Highland Fling dressed in a sort of kilt; their wire masks and cowhide whips are based on a Scottish military costume. Tall Ghosts were huge figures on stilts whose masked faces used to peep into the upstairs windows of homes on Market Street, provoking terror in little children; they were popular at New Year as well. A Tall Ghost costume can be seen at the Tourist Bureau on Thames Street in St John’s. Also popular at Christmas, though now more prevalent in Antigua’s Carnival, is the Dancing Jumble or Jumpa-Ben. which has its origins in Guinea, Ivory Coast and Benin. This character masqueraded on stilts to the music of kettle and bass drums, fife, triangle (ching-a-ching) and a “boom pipe” made from lengths of iron pipe. 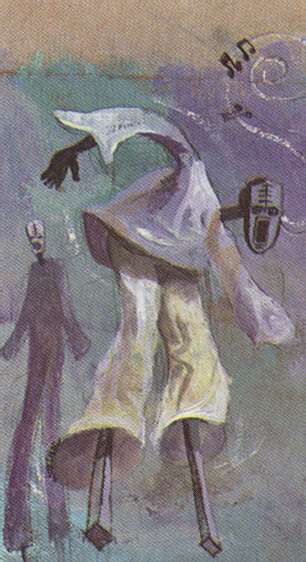 The Kwuya or Stilt Dance is very difficult to do, and the dancer must be able to defy gravity with a high level of skill if he is to remain upright. In 19th-century Antigua, quadrille parties were popular in high society, and the halls were decked, not with boughs of holly, but with sprigs of fragrant allspice (called “pimento” in Antigua and Jamaica). Bay leaf was also used for decoration, and cherry branches were made into trees. There were subscription dances every week, to the music of fiddle, tambourine and triangle. Drinks included fermented Christmas bush, ginger and water molasses; Christmas balls were accompanied by feasts of mutton, pork, turkey, duck, fowl, guinea-bird, ham, tongue, cakes and tarts. A new dress had to be made for every day of the three-day holiday. For the poor, Christmas was the only access to the delicacy of pork and fried dumpling. On the streets, compliments of the season were given for a donation — “Long life and crosperity!” (sic). Elements of all these customs still survive in 20th-century Antigua. 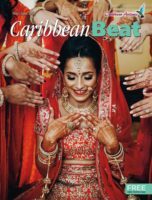 Perhaps the most lavish of modern Christmases is to be found in Trinidad and Tobago, whose diverse history and relative wealth have given the festival a national flavour in which the large non-Christian communities join. The season begins as early as November, when the cooler breezes hint at the tail end of the rainy season and brilliant red poinsettias and lacy white Christmas bush begin to transform gardens. 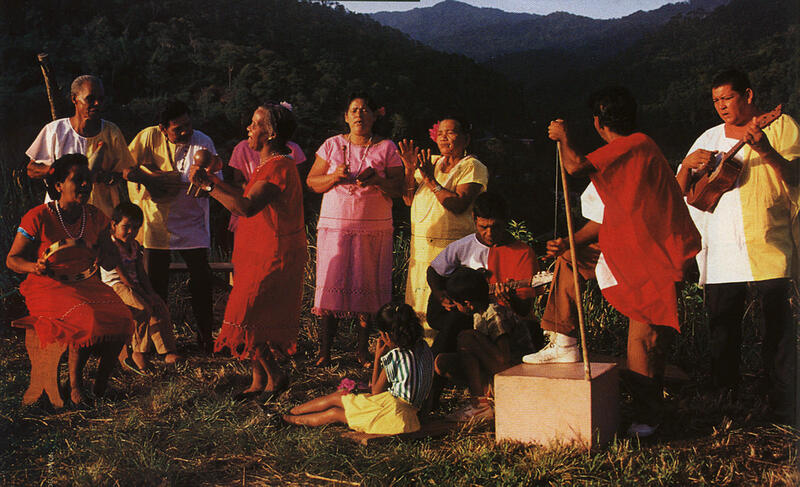 Christmas carols and local songs take over the radio and the parang season begins. 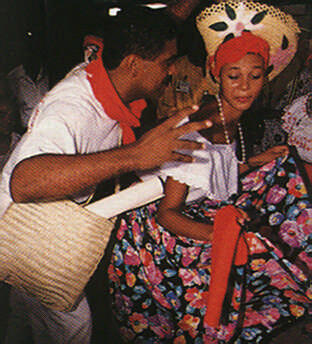 Parang, originally from Venezuela, is the traditional Christmas music of Trinidad — lively Spanish-style music that calls for fancy steps and swinging hips. Traditionally, paranderos go from house to house serenading neighbours and sampling poncha crema (a well-spiced version of eggnog), sorrel, ginger beer and strong drinks like rum and whisky, as well as food. 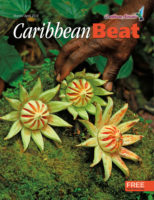 Parang is infectious music, strongly rhythmic, hard to resist, and it accompanies many of the season’s parties. Christmas is office party time, the high season of the social calendar, with various gala events requiring formal wear, dressing to the hilt. In recent times Indo-Trinidadian singers and calypsonians have added an extra (“chutney”) flavour to the Parang. Scrunter’s Ah Want a Piece of Pork (ah want a piece of pork, ah want a piece of Fork for mih Christmas), backed by a parang band, called everyone out to dance and eat. Trinidadians expect to put on a few pounds for Christmas, confident that they will lose them afterwards in the frenzy of Carnival. People visit friends and family during the season, and you have To sample every auntie’s black cake and taste every granny’s sorrel, not to, mention the lady-next-door’s poncha crema and the pastelles that Mom makes. Pastelles, a gift from Trinidad’s Amerindian and Spanish heritage, are a cornmeal pocket stuffed with minced beef, highly seasoned, with capers and olives among the essential ingredients. All this is merely training the big Christmas Day lunch. Turkey is the centre of attention, stuffed with seasoned breadcrumbs and giblets, though many people prefer a minced beef stuffing to make it a little richer. Ham is a must, and even people who do not eat pork will tolerate it on their table and offer it to ham-hungry guests. Chicken and roast beef are complemented by pastelles, vegetables, macaroni pie, potato and other salads. This all-encompassing meal provides a focus for family gatherings. Christmas Day itself is mainly for family, with friends visiting throughout the holidays to bring gifts and sample the goodies. Most Christians make sure to go to mass, even if it is the only time for the year, either at midnight on Christmas Eve or early on Christmas morning. The Christmas setting is important, so the house must be cleaned thoroughly, the tree put up and decorated in good time, and Christmas greeting cards hung up or collected in a prominent place. Houses are painted, even if only on the outside, and new curtains, furnishings and appliances are added, as far as the pocket will allow (though Christmas is a time when people far outdo their resources). The season ends with the massive parties of Old Year’s night, followed by the exhausted somnolence of New Year’s Day. 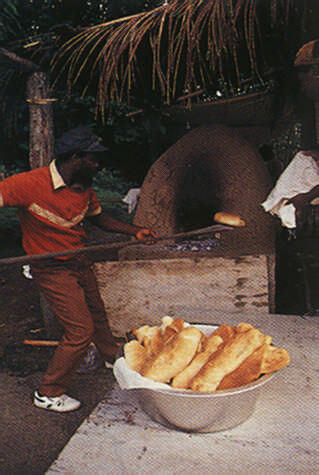 Most of the islands celebrate Christmas in a similar way these days, but with their own favourite dishes and customs. In Barbados, for example, along with the turkey and ham, the speciality is jug-jug, a dish made with ground meats, guinea corn and pigeon (gungo) peas. This may have originated with nostalgic Scottish settlers who needed a tropical substitute for haggis. For Jamaicans and Guyanese, ham is a must, but they don’t feel compelled to eat turkey: they prefer chicken. Jamaicans serve spicy jerk chicken, and curry goat is likely to be served as well, especially if the family is a big one. In Guyana and Tobago a goat, sheep or cow may be slaughtered to feed a big family. Chow mein and fried rice is a favourite in Guyana; garlic pork, introduced by the Portuguese, is popular in Antigua and in Trinidad, where it is a must for the Portuguese community. Christmas cakes range from rich dark fruit cake, often called Black Cake, to the lighter brown fruit cake which has no burnt sugar or browning; both are laced with rum or wine. In most islands, dark red sorrel is a non-alcoholic Christmas beverage made from a plant which produces its fruit at this time of year; but in Jamaica, it is a strong alcoholic liqueur, made with Jamaican white rum and sipped very carefully by the prudent. After unwrapping gifts and demolishing the Christmas meal, Barbadians might retire to the Queen’s Park for the annual Police Band concert, while Jamaicans get ready for all-night-till-morning parties. 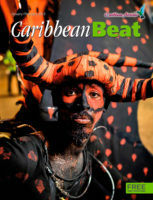 Young people in Trinidad and Tobago “burst bamboo” — their homemade explosions are contrived from bamboo and carbide. The Christmas season lasts longest for the French islands, which continue to celebrate until Three Kings’ Day on January 6, commemorating “les Rois” or the coming of the Three Wise Men. This is the day when people everywhere take down their Christmas trees, even in islands where the date is not significant. 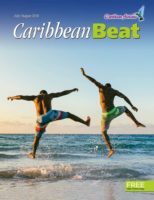 If you are in the Caribbean this Christmas, soak in the festive atmosphere, the goodwill, the partying and visiting, the special heart-warming mood that fills the air. Soak in the Christmas songs, whether they are in Spanish, Hindi, Patois or English: they all tell of good fortune, health, happiness and good times. And relish this region’s unique array of Christmas customs, some of them from contemporary North America, others of much deeper and darker origin. These islands, which never see holly or mistletoe, reindeer or snow (and certainly don’t miss them), have made traditions of their own to enjoy.